This verse popped out to me during my quiet time today and I decided to do some journaling in my Journaling Bible. God is doing amazing things in my life right now. I am in a very special season. I can feel His love and protection being poured out. But, I have been through trials, too. Times when it is harder to recognize the truly unconditional love of our God. Today I want to encourage you that no matter your season, He is there. He is waiting for you to fall into His arms. 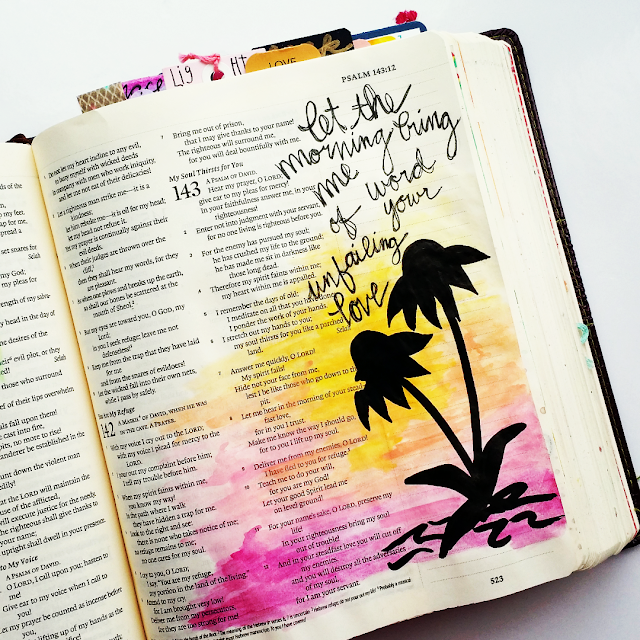 His Unfailing Love will hold you, comfort you, guide you and sometimes drag you along. What is God saying to you today? Whatever He is asking, I want you to say YES! Say YES to God! He will provide any needs while you are obedient. He never changes. His Love will never fail. My prayer for you today is the prayer of the Psalmist, that the morning will show you word of His Unfailing Love. Here is a list of supplies I used for the page.